Are you looking for something unique like this Tessellated Mens Wedding Ring? Well, you won’t find it at the mall? GIVE US A CHANCE!! 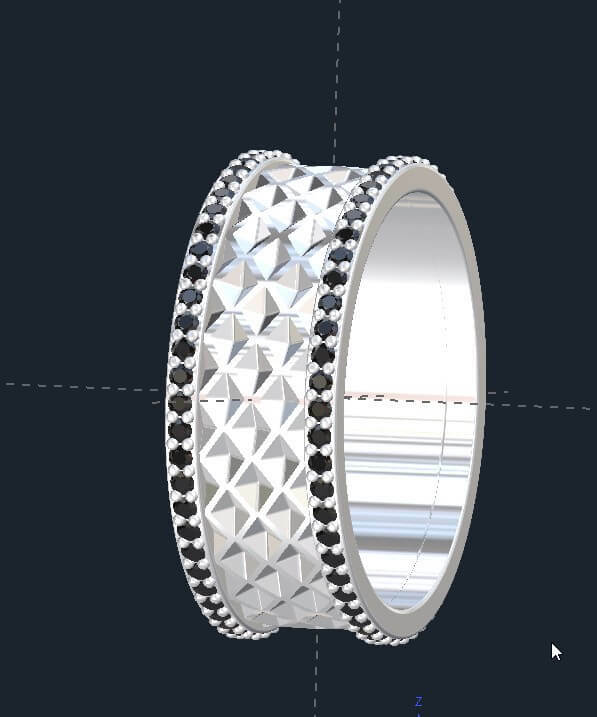 This Tessellated Mens Wedding Ring has a inverted diamond shapes going around the ring. 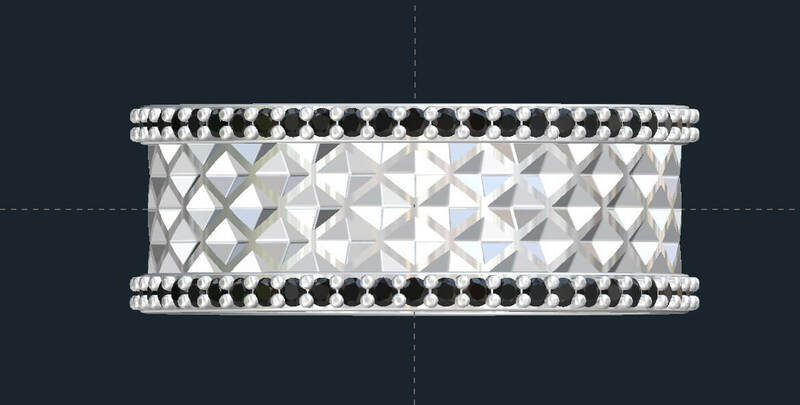 it also had diamonds going around the outer rails. We can create a Mens Wedding Rings based on your requirements that are exactly what you are looking for. Do you have a specific type of pattern or shape you want used? We can do it. Check out our portfolio of custom men’s wedding bands and if you don’t see what you want, send it to us and we will look into creating it for you. We can create almost anything you can dream up. METAL OPTIONS: Bronze, Brass, Sterling Silver, Argentium Silver, Rose Gold, Yellow Gold, White Gold, Palladium, and Platinum. ACCENTS: Depending on your design, a variety of stones can be set in our Tessellated Mens Wedding Ring. SIZES: Available in sizes 5-12 The starting price is for a Tessellated Mens Wedding Ring in Sterling Silver with CZ. Please contact us for alternate pricing options. Click HERE to see another Tessellated Mens Wedding Ring. 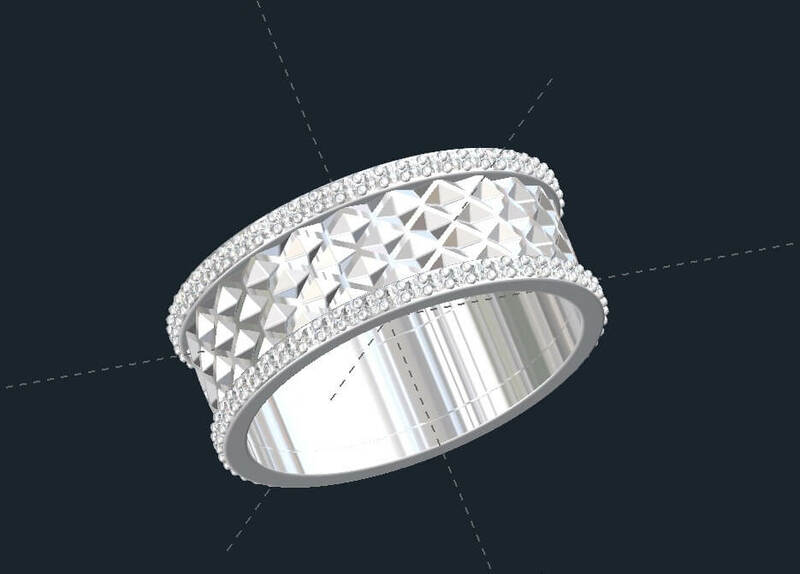 Click HERE to learn more about custom jewelry, view our portfolio, or to contact us about a Tessellated Mens Wedding Ring. It can cost less than you think to have your very own custom wedding ring made just for you. Why settle for the lame and overpriced wedding rings from the retail stores when we can make something showing your style and personality?